We underestimate perhaps how significant a figure Gioachino Rossini was in the first quarter of the nineteenth century. Astonishingly he had already written sixteen operas before the dazzling success of The Barber of Seville in 1816 when he was still only twenty three years old. He dominated the world of opera, writing some forty works for the stage before abandoning the genre altogether in his late thirties. Historians debate the reasons for his retirement, but as to the popularity of his compositions in his lifetime there can be no doubt. Audiences flocked to his productions and Rossini was as adept at devising tragedies as he was at writing rip-roaring comedies. La Cenerentola which followed less than a year after The Barber of Seville, receiving its premiere in Rome on 25 January 1817, was just as successful as its famous predecessor. Working within the technical limitations of the early 1800s, Rossini’s Cinderella abandons the fantastic elements of Charles Perrault’s fairytale - there is no carriage transformed from a pumpkin or fairy godmother - but that does not stop it from being just as magical. 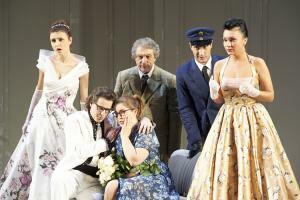 With disguise and mistaken identity serving to dupe the story’s less deserving characters, there are plenty of moments to laugh at, but Rossini’s opera also serves as a lesson on the nature of trust and forgiveness. And the music is glorious. Rossini was not only a major exponent of the bel canto style; he revolutionised the way in which music and plot work together to create a dynamic and fluid operatic form the like of which had never been seen or heard before him.